I don't remember my "first" Christmas. My first memories of Christmas are blurred together in the first years we lived on the farm. Christmas came later in those years of World War II. The merchants didn't start their Christmas advertising until after Thanksgiving. To a four or five year old like me, the month between Thanksgiving and Christmas was an eternity. The first order of business was to get a Christmas tree. There was no native tree around Taylor, Texas that resembled a Christmas Tree. Mountain Juniper trees from south of Taylor were imported by individuals looking to cash in on the holiday. Their idea of "cashing in" was to make enough money for their families to have a Christmas. The date of our tree shopping varied, depending on when our favorite tree vendor put his wares on display. Daddy and I did the tree shopping in the front yard of a Mexican gentleman who lived across the street from "Swede" Anderson's blacksmith shop. The yard featured several dozen trees of various sizes. The price range was probably from about fifty cents to a dollar and a half. We were in the fifty to seventy-five cent range, which meant the tree would be about five feet tall. As soon as Daddy had time to spare, he would cut the bottom of the tree square with his handsaw. A stand was constructed from scrap lumber. We later found that planting the tree in a bucket of wet sand kept it looking good much longer. The tree was decorated from a box of heirloom ornaments and tinsel that had seen many Christmases. All the family would gather at our home for the Christmas party. The record attendance stands at 64 souls. After the big evening meal, Santa would appear. As some of us cousins grew in years, we had great fun counting noses and seeing which of the uncles was missing when Santa came. Then we knew who Santa was. One year Daddy threw us all a curve. He got our hired man to come to the door in the family Santa suit. The hired man had a couple of nips of strong waters before he appeared, so it was really a memorial time. Our Christmas meal consisted of the traditional turkey, dressing and the side dishes. Mama made the turkey, dressing and potato salad. The rest of the family brought their specialty side dishes. The menu never varied for years. We would not have had it any other way. Things are different now. You never see a mountain juniper tree because nearly everyone has decided they are allergic to cedar. Pine, spruce and plastic trees are in vogue, each costing a lot more than should be allowed. The cousins have scattered to the four corners of the States. The following generation goes to their in-laws. Merchants start their Christmas the middle of August. Christmas in Texas today is a mixture of ethnic traditions. One celebration that we are glad didn't catch on took place in McDade in 1883. A mob took three suspected outlaws out of the town jail and hung them on Christmas Eve. The account doesn't mention what type of tree was used. The Texas cowboy is celebrated with wreaths of barbed wire centered with an old boot. Wreaths of cactus pads strung together celebrate our nearness to the desert. Whitetail deer or longhorn steer pull Santa's sleigh. The Mexican roots of Texas are saluted with tamales and menudo. The Texas passion for barbecue produces as many smoked turkeys as baked ones. The Cajun influence from Southeast Texas is bringing in the fried turkey. Citrus fruits from the Rio Grande Valley and pecans from Central and East Texas are found all over the world at Christmas time. 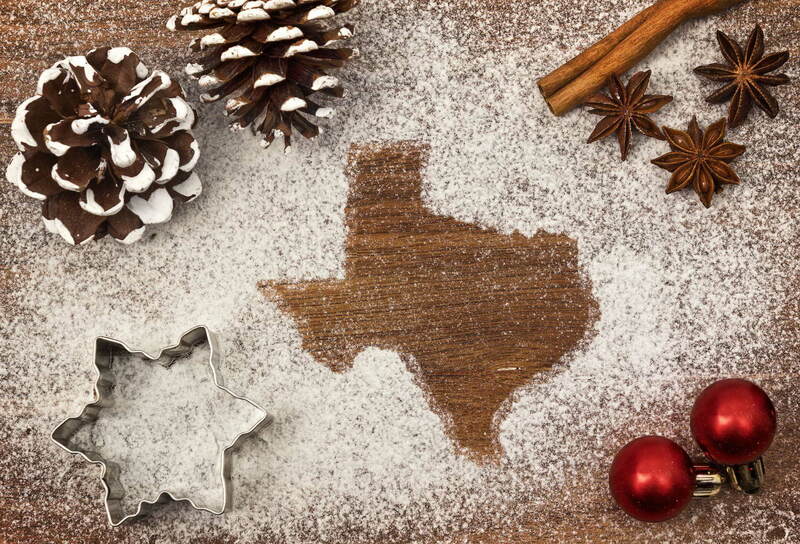 You might want to add one of these items to your traditional Christmas to remember Texas. Slowly sift one cup of the sugar into a hot, heavy frying pan, stirring constantly to caramelize. When sugar is melted, add the two cups of remaining sugar, milk and salt, stirring constantly. Cook to 236 degrees or soft ball stage. Remove from heat and add orange rind. Cool until you can put your hand comfortably on the bottom of the pan. Add nuts and beat until candy holds its shape. Drop by spoonfuls onto wax paper. Cool. Makes about three dozen. Cook sugar, light cream and butter to softball stage. Beat in dates, raisins, figs and coconut (You can use candied fruitcake mixture for part of fruit mixture). Add 1 or 2 cups of pecans and vanilla. When well mixed, roll into logs and wrap in damp cloth until cool. When the candy is cool, remove the cloth and wrap it in waxed paper and put away to ripen for at least two weeks. The longer it ages, the better. If times are hard around your house, you might want to try this low budget recipe from 1850 Texas. Pour into an unbaked pie shell and bake in medium (350°F) oven until crust is brown and filling is set. I wish you all the very happiest of holidays and thank you for the great response you have given me on Texas Cooking.